The number of Gartner clients buying IT service desk and service support management tools hasgrown steadily since 2007.Gartner estimates that 15% of ITSSM tools in enterprise ITorganizations are licensed under the SaaS model. We expect this growth to continue, asdemonstrated in our client inquiries conducted from June 2011 to June 2012, where organizationslooking to acquire new IT service desk/ITSSM tools had SaaS solutions on their shortlists 75% ofthe time. Organizations will continue looking to SaaS for many reasons, such as cost predictability, ease andtimeliness of upgrades, and the ability to acquire an entire suite of ITSSM solutions across multipleenvironments (i.e., production, test and development instances). While Gartner expects this growthto continue, we also expect a boomerang effect, where early adopters of SaaS ITSSM solutionsreturn to perpetual licensing models. 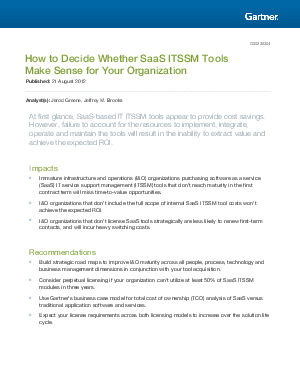 Our strategic planning assumption predicts that, by 2014, 30%of organizations using ITSSM tools will switch to on-premises.